The Public Service Labour Relations Act (PSLRA) provides for three types of grievances: individual grievances; group grievances; and policy grievances. When a number of employees in the same department or agency believe that their collective agreement has not been interpreted or applied correctly, they can ask the Union to file a group grievance on their behalf. Each of the employees seeking relief must sign a consent form, which makes it possible to deal more effectively with the dispute. As with individual grievances dealing with collective agreement interpretation, it is a requirement that the Union indicate its support for the group grievance to be dealt with. Group grievances may be referred to adjudication, with the consent of the PSAC, our bargaining agent. Only the Union or the Employer may file a policy grievance pertaining to interpretation or application of the collective agreement. They are automatically presented at the final level of the grievance process, with the consent of the Public Service Alliance of Canada as our bargaining agent. Policy grievances may be referred to adjudication, with the consent of the PSAC, our bargaining agent. Union representatives face many and varied issues at the workplace. Some are grievances and complaints from the membership. Others are problems with management and the labour-management process. Still others are to be found within the union movement itself. Whatever the problem, there is a common thread that a union representative must weave. They must first investigate the problem, and then develop a strategy or action plan. Here are the seven Ws essential to your gathering all the facts. Using these tips can save you a lot of grief! Ensure you record the member’s full name, the employer, branch or division, section or unit, title and job classification. The name and title of the immediate supervisor and of anyone else directly involved should also be obtained. WHAT: ‘What’ happened that caused the violation? Was it an issue regarding the withholding of leave? Was it a safety issue? Was it disciplinary action? Was it the unfair treatment of a member? Is it an issue that you wish to bring forward to labour-management consultation? especially given the time limits in the grievance procedure. Include the pertinent times and dates, or how often and how long the act or omission took place. WHERE: ‘Where’ was the place the action occurred? Give exact locations if the event occurred in different places. Give the distance between locations, if it has a bearing on the issue. WHY: ‘Why’ describes the reason behind the grievance or complaint, or the reason you want an issue placed on an LMC agenda. Has there been a violation of either the collective agreement, an arbitral award or an Act of Parliament? Are employer policies, regulations or past practices at issue? This ‘W’ directs your attention to that something that has been violated and points you to the correct recourse mechanism that should be used. WANT: The ‘Want’ relates to the adjustments or corrective actions necessary to correct the injustice. In a grievance, it may be to place the aggrieved member in the same position he/she would have been in had the act or omission not occurred. Ask for redress in full in order to make the member whole — pay restored, files cleared, etcetera. If you want a departmental policy changed through the consultation process, say exactly what it is you want changed. WHOA!! Take another look. Review your case. Have you got all the facts you need to properly deal with the issue? Keep asking questions until you get everything you need! One last tip. When you have the answers, and the time comes to write your report, use the KISS principle — Keep It Short and Simple! Since 1983, two federal statues, the Access to Information Act and the Privacy Act, have provided individuals with a right of access to both non-personal and personal information held by the federal public sector. In addition, the Privacy Act contains provisions regulating the confidentiality, collection, correction, disclosure, retention and use of personal information. Individuals may request records directly from the institution which has custody of the information. Accessible information includes written records, video, sound and computer files (such as emails). The Acts establish codes of fair information practices which apply to government handling of personal records. The Federal Court has ruled that government has an obligation to answer all access requests regardless of the perceived motives of the requesters. Similarly, the Commissioner must investigate all complaints even if the government seeks to block him from so doing on the grounds that the complaints are made for an improper purpose. The Employer has applied an inappropriately rigid definition of personal information to your Privacy request and you need contextual information available under Access. You are dissatisfied with the handling of your Privacy request and want to review the working file prepared by your Employer’s Access to Information and Privacy section. Requests for personal information made under the Privacy Act are free of charge. Requests for non-personal information made under the Access to Information Act are not. payment for machine readable records (eg. search for emails by keyword). In addition to the legitimate charges government institutions are entitled by law to levy, government institutions wishing to maintain secrecy will attempt to dissuade requesters by providing unreasonable and extreme estimates of search and preparation time and requesting a substantial deposit up front. In addition to the option of filing a formal complaint, there are other tactics available to members to deal with such institutions. file a formal complaint every time a government intitution provides an unreasonable estimate or charges and unreasonable fee for their compliance to the Act. Government institutions have 30 days under both Acts to provide you with the records. Under certain circumstances, such as a request involving a large number of records or a requirement to consult with another institution, a government institution may extend for a reasonable period, usually another 30 days, the time required for them to comply. Some government institutions, however, will take a 30-day extension to give them the time to prepare damage control measures or to deal with the problems or embarrassment that release of the records will cause. Such a delay is not permitted under the Acts. A complaint should be filed every time an extension appears unreasonable or unwarranted. A complaint should also be filed every time a government institution takes longer than the 30 days stipulated under the Acts and has not applied a formal extension. So now you have the records . . . or do you? The response to your request will usually include a covering letter detailing any documents that have been exempted or severed. The Acts require government institutions to clearly specify what sections of the Acts are relied upon to refuse to disclose records. There is any number of legitimate reasons for not providing information; however, some government institutions will use bogus or improper rationale to justify their refusal to disclose information. Failure to specify the grounds for withholding records is itself cause for complaint. The records received should be carefully examined for indications of other records that have been withheld or overlooked. anything that looks odd and suggests the possibility of missing records. authorizing you to place a request for and receive records on their behalf. authorizing you to process any complaints on their behalf. You will require one of each original letter for each source where records are requested. Important Note: Union representatives have a moral obligation to maintain the confidentiality and security of any records and information obtained on a member’s behalf. Generic wording for the most commonly filed grievances can be found on our website here. It is to be used as a reference and the wording may be adjusted to take into account the specific issues being grieved. As well, grievors using this information must ensure that they have the knowledge of the appropriate articles in their collective agreement so as to ensure the correct articles and/clauses are cited. Why is a complete and current Statement of Duties and Responsibilities so important? Your salary is compensation for the work you perform. So, it is important that your statement of duties be current and accurate, reflecting what you actually do. The adequacy of the work description Provided to the employee is undoubtedly one of the major areas of labour-management friction at the Local level. However, generally speaking, if the statement of duties for your position is more than four or five years old, it won’t accurately reflect the actual duties you perform. the lack of revisions to existing work descriptions as work assignments change. Upon written request, an employee shall be provided with a complete and current statement of the duties and responsibilities of his/her position, including the classification level and, where applicable, the point rating allotted by factor to his or her position and an organizational chart depicting the position’s place in the organization. What if I don’t have a copy of my Statement of Duties and Responsibilities? The collective agreement article quoted above provides two primary rights to our members. First, upon request, there is an entitlement to receive the statement of duties and responsibilities and, where applicable, the point rating allotted by factor to the position encumbered. Second, that the Statement of Duties provided must be both complete and current. Employees are also entitled to the organizational chart depicting the position’s place in the organization. If you don’t have a Statement of Duties and Responsibilities, ask for and obtain one. If your Employer does not provide you with this Statement in accordance with the terms of the collective agreement, then you should grieve the failure to do so. Once you have the Statement of Duties and Responsibilities, you should review the job description that is given to you and ensure it is complete and current. Where a member contends that the Statement of Duties and Responsibilities provided by management is neither complete nor current, a grievance under the Statement of Duties article of the applicable collective agreement is the appropriate first step to take. How do I proceed with the grievance? You should file a grievance alleging that the employer has failed to provide you with a complete and current statement of duties. The remedy (corrective action) should be that the additional duties be added to your statement of duties. You will be required to specify the duties (this does not and should not be detailed) that you want added to your statement of duties, provide evidence that you are performing them on a regular basis and – very importantly – that these duties are performed at the request or under the direction of the employer. I grieve the employer’s failure to provide me with a complete and current statement of duties and responsibilities. This violates Article ______ (insert Article #) - Statement of Duties, of my collective agreement. That I be provided with a complete and current statement of the duties of my position, effective from _____________ date. You should list the duties you wish to have added to your job description. However, do not attach this list to your grievance! Rather, give it to your Union Representative. Such grievances are processed in accordance with the grievance procedure article of the applicable collective agreement and may proceed to adjudication, if not resolved. Classification is one of the more contentious issues for members in the workplace. The majority of problems regarding classification involve members who feel their level of compensation is not equitable with the work they perform. Since pay rates are linked to classification levels, the only recourse to receiving greater compensation is to seek a higher classification level. The job evolved over time and the classification level is out of date. For members covered by Treasury Board legislation, there is an established process to follow to address classification issues. For members employed by agencies or private sector companies, please consult the appropriate collective agreement. The Public Service Labour Relations Act and Regulations allows employees to formally challenge the group and level of their position by submitting a classification grievance within 35 calendar days of receipt of a Classification Notice. Most collective agreements include a clause which allows a member to request an accurate, current description of their duties, also known as a work description (WD). This clause is often referred to as Statement of Duties. The member must make a written request (email) to their direct supervisor for a copy of the WD, citing the appropriate article in the collective agreement. It is recommended that the member give a deadline (e.g. 30 days) for management to complete the request. If the WD does not accurately reflect the duties of the member (duties are either understated or missing completely), then they should contact their steward as soon as possible in order to file a job content grievance. This grievance differs from a classification grievance in that it targets the textual content rather than the level attributed to the WD. The member must be prepared to work with the steward to identify the duties which are either missing or misrepresented. Once the job content issues have been resolved, then the employer must render a revised classification decision. If the decision does not resolve the classification issue, then a classification grievance can be filed. It’s important to note that even though a job content grievance can be successful, the revisions/additions may not be enough to warrant an upwards reclassification. It’s a numbers game and a position must meet the threshold rating to be changed. An important component to a job content or classification grievance is the level of retroactivity allowed in the case of a reclassification. This is especially relevant in cases where a position has evolved over time. If management refuses to complete the request under the collective agreement for a current WD, then the member should contact their steward as soon as possible in order to file a grievance against the breach of the collective agreement. 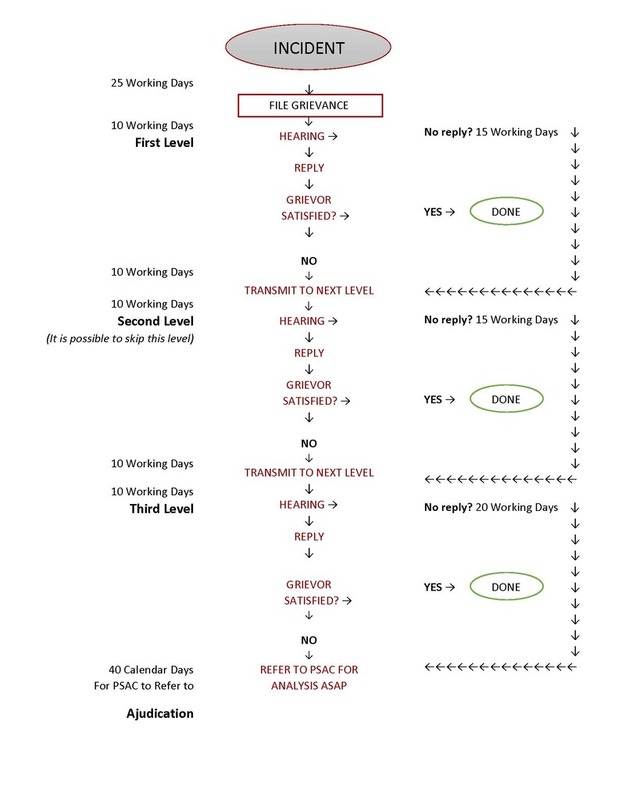 The classification grievance procedure is a relatively simple process, as there is only one level (the final level) and the time limits are different — 35 calendar days. Full-time PSAC classification experts in Ottawa normally conduct representation before final level classification grievance review boards. However, all classification grievances should proceed through normal Local/Component channels prior to being forwarded to PSAC Classification Officers. As the time limits regarding the submission of classification grievances is strictly adhered to by the Employer, members contemplating grievance action should act immediately. a copy of the current organization chart that includes your position. While these four items are absolutely essential, any further documents and/or information relative to the position are also very useful to the Classification Officers as they prepare their case. I grieve the classification of my position. and that I be made whole. Classification grievances are NOT adjudicable. The Public Service Labour Relations Act protects classification decisions as a management right which is not subject to the scrutiny of a third party. Similarly, if appointment to the higher classification at an earlier date is requested, the adjudicator will decline jurisdiction on the grounds that, pursuant to the Public Service Employment Act, only the Public Service Commission has the power to appoint. Classification grievances deal only with a classification decision — that is, the assignment of points to a statement of duties. It does not deal with the contents of the statement of duties. If you are also filing a work description grievance regarding your statement of duties and responsibilities, your classification grievance should be held in abeyance until the outcome of the statement of duties grievance is known. If the statement of duties changes, then a new classification decision will be made which will be subject of the classification grievance. However, the employer may decline putting the classification grievance in abeyance as is their right, PSAC encourages that the attempt be made regardless. There is no retroactivity beyond 25 days prior to filing the Grievance. If a classification decision is issued you have 35 calendar days to file a grievance against that decision. If the grievance is to be filed in the event of a statement of duties change and subsequent classification decision, this classification grievance will protect the right to have the change in classification made retroactive to the date of the filing of the grievance. Where there are discrepancies as to the effective date of the classification decision, a remedy cannot be found through the classification grievance process. Instead, the Staff Relations Grievance Process contained in the relative collective agreement must be utilized. The PSAC may not recommend a classification grievance be submitted, or may request that a classification grievance be withdrawn. In such an event, it must be noted that no representation will be provided by PSAC Classification Officers should the member still wish to pursue the grievance. The member will have to provide his/her own resources through written and/or formal representation to the Grievance Advisory Board. What happens when I file a classification grievance? When you file a classification grievance, it is important to remind your department to forward it to the Representation Section of the Public Service Alliance of Canada. The PSAC then assigns a Classification Officer to the grievance file. You should always retain copies for your records. For groups, such as IS, where only the whole job is rated, we need only the position level instead of a point rating. A PSAC Classification Officer reads your work description and considers the ratings in light of the classification standard used by the employer. For those employers using Treasury Board’s standards, there’s a different standard for each occupational group. One of the many problems with these standards is that they are very old, with some dating back to the 1960’s. Often, they don’t reflect the way work is done in the public service today. Each standard has a number of Benchmark Position descriptions (BMPs) that briefly describe and rate jobs in that occupational group. Sometimes, none of these benchmarks resembles your position. As an example, there are more than 18,800 AS positions under Treasury Board and 16 BMPs in the AS Standard. Usually, elements from several different BMPs are used to rate the elements in an employee’s job. The PSAC Classification Officer assesses whether there are plausible arguments to be made to raise the rating of enough elements in order for the position to be rated at a higher level. They have to use elements in the BMPs in order to argue why your job should be rated higher in, for example, knowledge than one of the BMPs that is at the same level that your job is presently rated, and why your job is comparable to a higher-rated BMP. Other information in the file is also considered. If you are requesting reclassification to a level that is the same as your supervisor, and the supervisor is not grieving his or her level, the grievance cannot succeed. The PSAC Classification Officer also considers how other positions reporting to the same supervisor are rated and the rating given to similar positions throughout the department. If a grievor thinks their job should be rated higher in the belief that it’s similar to another higher-rated job, the Classification Officer looks at the comparator job and its rating. The comparator job may have been over-rated, and, in such cases, the PSAC doesn’t risk having one member’s job being reclassified lower by using it as an argument at another member’s hearing. It is PSAC policy to provide representation only when there is a reasonable chance of a successful outcome. About 25 per cent of classification grievances submitted are represented by the PSAC. In those cases, the Classification Officer develops a presentation, using the grievor’s job description and the classification standard, to argue for a higher rating. A hearing date is scheduled and the officer makes the presentation to a classification grievance committee. If the PSAC Classification Officer determines that realistic arguments to support upward reclassification can’t be developed, the grievor has the right, at his or her own expense, to prepare and present arguments to the Classification Grievance Committee. Or, they can decide to withdraw the grievance. What is a Classification Grievance Committee? another person, usually a line manager, experienced in the application of the classification standard being used. Committee members must not have participated in the classification decision being grieved. Nor can they be a supervisor of the position in question nor be in a position of potential conflict of interest. If the grievor is being represented by the PSAC, he or she may choose whether or not to attend, either in person or by conference call. The Committee listens to the presentation made on the grievor’s behalf. They are generally provided with a written copy of the PSAC presentation. They may ask questions of the grievor or his/her representative to clarify their understanding of the grievor’s duties. After the grievor and their representative leave, the Committee may ask management, usually the grievor’s supervisor, to provide information on assigned duties and responsibilities. The Committee then deliberates and tries to reach consensus on the evaluation of the position. In the unlikely event that consensus isn’t reached, majority and minority reports are prepared. The Committee makes a recommendation on the classification of the position to the Deputy Minister’s nominee. The nominee then either confirms the Committee’s recommendation, makes a decision in cases of majority/minority reports or, in rare instances, makes a new decision. The grievor is notified, in writing, of the final and binding decision. Classification grievances involving generic work descriptions are more difficult to win, as departments are reluctant to raise the salary of one position, let alone a small or large group of positions. Can the Classification Grievance system be described as fair? A fair process? Not at all. Classification is not an exact science. The current Treasury Board standards contain loopholes the employer can use to deny a grievance. Take as an example two employees in the AS group, working for the same department or agency in different regions. They may have virtually identical duties and responsibilities, but one region may be significantly larger in terms of area and number of employees. While everyone knows that in a larger region more staff are hired so that each employee’s workload is similar from one region to another, the employer may argue that the difference in the size of the two regions affects the impact of the position for the Decision Making element, according to the element definition. So, even when a PSAC Classification Officer believes his or her arguments support upward reclassification, the classification grievance doesn’t necessarily succeed. Disagreements over pay — either substantive or acting — are a common issue giving rise to grievances. When an employee is required by the Employer to substantially perform the duties of a higher classification level in an acting capacity and performs those duties for at least the period specified in (b) below, the employee shall be paid acting pay calculated from the date on which he or she commenced to act as if he or she had been appointed to that higher classification level for the period in which he or she acts. Filing a grievance correctly is an important step in resolving any issue in a manner that is acceptable to you. They must meet the qualifying period for acting pay as outlined in the relative collective agreement. The member must provide documentation and proof that he/she has met the three criteria outlined above as well as examples of the work performed on behalf of the employer. I grieve that the employer is not paying me appropriately for the duties I am performing. I am asked to perform the duties of a higher position. As a result, the employer is not following the provisions of Article __________(Pay Administration) of my collective agreement. That I be paid in accordance with my collective agreement for the performance of the duties I am required to perform, retroactive to the date on which performance of these duties began ______________ (insert date) and that I be made whole. As qualifying periods for acting pay vary from collective agreement to collective agreement, check for qualifying periods of acting pay for the member grieving. Grievances under the Acting Pay provisions of the collective agreement may proceed to Adjudication before the Public Service Labour Relations and Employment Board (PSLREB). The Representation Section of the Public Service Alliance of Canada, which conducts representation at Adjudication, must approve the grievance for referral to the PSLREB. While pay grievances are adjudicable, those dealing with classification are not. Therefore, you should NOT use the words classification or effective date in your acting pay grievance. If you do so, there is a very serious risk that an adjudicator will decline jurisdiction on the grounds that to accept jurisdiction would be to interfere with the off-limits subject of classification. The Public Service Labour Relations Act protects classification decisions as a management right which is not subject to the scrutiny of a third party. Mediation is an informal process that allows the parties to resolve disputes with the assistance of an impartial third party. The purpose of mediation is not to determine who is right or wrong, but rather to reach a mutually satisfactory resolution of the matter at hand. It can arrive at creative solutions acceptable to both parties that are not always available through the formal process. The mediation process is voluntary and your Union representative can provide you with your options at that particular time. In a mediation process a participant can withdraw their participation at any given time without prejudice. Unlike formal procedures, mediation can address the issues and interests surrounding and underlying the matter in dispute. Problems can be looked at in a broader perspective. To be effective, mediation relies on the willingness of the parties to make an effort to resolve their dispute. As such, it is a voluntary process. Participants should approach a mediation session with open minds and be prepared to explore ways of settling the dispute. If one or both parties enter a mediation session with no intention of moving from a preset position, mediation will be a waste of everyone’s time. If a party is unwilling to reconsider and modify its position in a dispute, it is preferable to proceed directly to the formal procedure. It is USJE’s belief that mediation is and should not be the forum for an employer representative to simply collect information in order to prepare for an upcoming hearing. The mediator does not decide the outcome in any dispute. The parties talk about the issue. With the mediator’s help, they seek a settlement both parties can accept and live with. There are no minutes taken of the proceedings or reports issued by the mediator. When a dispute is settled in mediation, the parties will normally sign a memorandum containing details of what has been agreed to. Most departments and agencies offer mediation services as do the Public Service Labour Relations and Employment Board, the Canadian Human Rights Commission and other enforcement bodies. It is important to note that these bodies do not retain jurisdiction over agreements signed off during a mediation process. It is absolutely paramount that mediated settlements are comprehensive and well-crafted to ensure compliance by both parties. The above bodies often provide regularly scheduled training sessions on their particular mediation process. The National Joint Council (NJC), established in 1944, is a consultative body bringing together representatives of management and public service unions. Co-development of workplace improvements by the employer and a bargaining agent may take place under the auspices of the NJC. As our bargaining agent, the Public Service Alliance of Canada (PSAC) represents the interests of USJE members at the NJC. Issues of specific concern to the USJE and its members are brought forward by the PSAC on our behalf. While the Council meets quarterly, NJC committees meet on an ongoing basis. Once agreed upon, some of these items are then included in our collective agreements. A significant breakthrough at the NJC in the late 1970s was the agreement upon a grievance procedure for settling disputes on the interpretation of NJC policies. A classic example of the value of the NJC is the Public Service Disability Insurance Plan. The PSDIP was introduced in 1970 through the NJC. This plan provides income for members whose illness or injuries prevent them from working for a long period of time. When these benefits were made taxable in 1974, the NJC provided for higher benefit levels and annual indexing to protect the value of these benefits. The plan was extended to seasonal employees in the early 1970s and to part-time employees in 1982. Since 1978, NJC Directives such as commuting assistance, first-aid allowances and travel directive have been integrated into our collective agreements. The PSAC has been instrumental in improving relocation and travel regulations, such as mileage rates, as well as provisions regarding real estate and legal fees. Furthermore, the PSAC pushes for improvements regarding living accommodations for Crown-owned housing, protective clothing and Isolated Posts and Foreign Service Directives. Job security is a major concern of federal public service workers. The early 1980s saw the development at the NJC of a new Work Force Adjustment Policy (WFA) that partially met the needs of persons faced with job loss. Since its inception, the original WFA has been amended and improved substantially in the areas of notice, salary protection and retraining opportunities. The Work Force Adjustment Policy is now an appendix to most PSAC-negotiated collective agreements. The criterion for reviewing grievances is the intent of the directive and not where the test is the meaning of the specific words, as an example, in a collective agreement. 3) final level — Executive Committee of the National Joint Council. While the local representative is responsible for representing at the first level of the grievance procedure, the responsible USJE LRO will represent at levels 2 and 3. Grievances denied at the NJC final level may be referred to adjudication with the approval of PSAC as our bargaining agent. I grieve that I have not been treated within the intent of the (insert name of NJC Directive) in that my employer did not (insert your particular details). That I be treated within the intent of the (insert name of NJC directive) by providing me with (insert particulars) and that full redress be granted to be made whole. The following directives, as amended from time to time by National Joint Council recommendation, have been approved by the Treasury Board of Canada. Occupational Health and Safety Committees and Representatives. a) When a formal assessment of an employee’s performance is made, the employee concerned must be given an opportunity to sign the assessment form in question upon its completion to indicate that its contents have been read. A copy of the assessment form will be provided to the employee at that time. An employee’s signature on his or her assessment form will be considered to be an indication only that its contents have been read and shall not indicate the employee’s concurrence with the statements contained on the form. b) The Employer’s representative(s) who assess(es) an employee’s performance must have observed or been aware of the employee’s performance for at least one-half (½) of the period for which the employee’s performance is evaluated. c) An employee has the right to make written comments to be attached to the performance review form. ii)any written document which provides instructions to the person conducting the review. b) If, during the employee performance review, either the form or instructions are changed they shall be given to the employee. Upon written request of an employee, the personnel file of that employee shall be made available once per year for his or her examination in the presence of an authorized representative of the Employer. Whether you chose to file a grievance or not, one important aspect to remember about your performance review is that you ensure you exercise your right to make written comments attached to your performance review — more particularly with respect to those comments you disagree with. Note: You can also request that certain negative phrases or comments be removed from the performance appraisal. When an employee is suspended from duty or terminated in accordance with paragraph 12(1) (c) of the Financial Administration Act, the Employer undertakes to notify the employee in writing of the reason for such suspension or termination. The Employer shall endeavour to give such notification at the time of suspension or termination. When an employee is required to attend a meeting, the purpose of which is to conduct a disciplinary hearing concerning him or her or to render a disciplinary decision concerning him or her, the employee is entitled to have, at his or her request, a representative of the Alliance attend the meeting. Where practicable, the employee shall receive a minimum of one (1) days’ notice of such a meeting. The Employer shall notify the local representative of the Alliance as soon as possible that such suspension or termination has occurred. The Employer agrees not to introduce as evidence in a hearing relating to disciplinary action any document from the file of an employee the content of which the employee was not aware of at the time of filing or within a reasonable period thereafter. Any document or written statement related to disciplinary action which may have been placed on the personnel file of an employee shall be destroyed after two (2) years have elapsed since the disciplinary action was taken, provided that no further disciplinary action has been recorded during this period. When completing your grievance form, first check to see if there has been a violation of the Discipline Article in the collective agreement. If so, make sure that you indicate such a violation of the relevant article. In general terms, discipline normally consists of a letter of reprimand, suspension, financial penalty, demotion (if disciplinary in nature) or termination. I grieve the financial penalty of _______ (insert amount) imposed on me on (insert date) by (insert name of employer representative and job title). I grieve the letter of demotion dated ______ (insert date) signed by _______ (insert name of employer representative and job title). This letter of demotion is disciplinary in nature. Important Note: When you are dealing with grievances of a disciplinary nature, make sure that the management representative who imposed the discipline actually had the authority to do so. You can find these authorities outlined in the “Management Signing Authorities” within your respective department or agency.